Turkish lender Akbank reported strong 1Q18 earnings, beating consensus with net profit of TRY1.7bn, up 17% YoY. Its main profit drivers were loan growth and improved margins. However, while the NPL ratio declined, the Group II Loan ratio almost doubled QoQ to 10.2%. The TRY loans/deposits ratios rose further to 144%, although the headline 104% ratio was solid and unchanged. The Tier 1 ratio was a respectable 13.6%, modestly down QoQ on dividend payments and currency weakness. Akbank asset quality showed mixed trends. While the NPL ratio declined, the Group II Loan ratio almost doubled QoQ to 10.2%, which would have been 7.1% but for the Otas loan. However, gross NPL inflows of TRY522m came off the highs of 4Q17, while the net number was a much more manageable TRY 223mn as collections improved. The cost of risk is still very low at 42bp (or 24bp under IFRS 9). The total coverage ratio remains ample at 154%, while capitalisation is also solid (Tier 1 ratio: 13.6%, one of the strongest in the sector and up 20bp YoY, though down 60bp QoQ). We note that loan growth was concentrated in Commercial and Other Business banking as well as higher-risk GPLs, while the modest growth in FX loans (+5%) meant that loan growth was 18% YoY (in line with deposit growth). We also note that the TRY loans/deposits ratio has risen from 133% to 144% since 1Q17. This has undone much of the previous good work undertaken to rebalance the funding position, though it somewhat inevitable as the economy moves away from reliance on FX loans while depositors simultaneously seek shelter in USD deposits. The Credit Guarantee Fund (CGF) accelerated this phenomenon in 2017. A corresponding drop in the FX ratio to a very strong 72% left the headline number little changed at a healthy 104%. FX deposits grew 3% QoQ and now comprise 56% of total deposits, while TRY deposits were flat. Akbank reported a 16.7% YoY increase in 1Q18 net profits to TRY1.7bn. 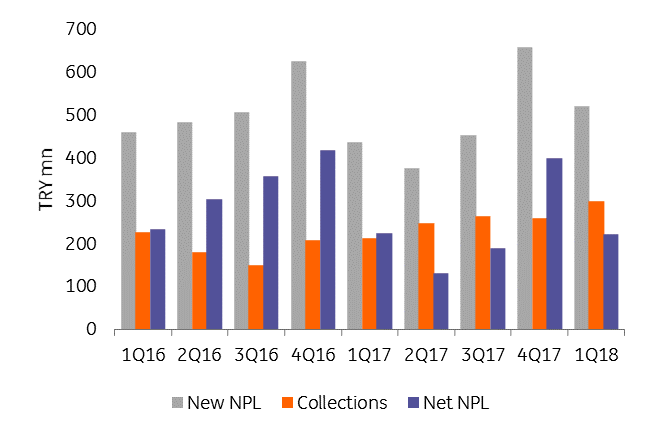 Net interest income rose 30.2% YoY to TRY 3.3bn as loan volumes improved 17.8% (still benefiting from the pre-CGF comparison) and 4.6% QoQ. NIM was flat on the year (after swaps) at 3.54%, but fell back 30bp YoY as higher funding and swap costs bit (a function of the dollarization of the Turkish deposit base, higher wholesale funding costs and higher CBRT liquidity charges). Moving on from NII, Fees & Commissions enjoyed another solid year, rising 19.1% to TRY810m, while the adjusted cost/income ratio remained extremely competitive at just 34.8%. Asset quality was more mixed. The headline NPL ratio fell back slightly from 2.1% to 2.0% QoQ as NPL inflows slowed from TRY400m to TRY223m QoQ (see chart). The bank, therefore, remains comfortably ahead of the sector average of 2.9%. The cost of risk also remained low, falling from 49bp in 4Q17 to just 24bp in 1Q18, due mainly to the impact of IFRS 9, without which it would have remained stickier at 42bp. 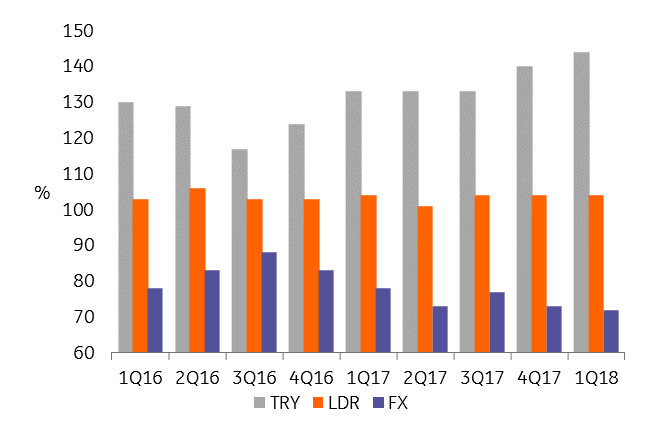 However, in a sign that the benign backdrop for Turkish asset quality metrics is changing as growth slows and the currency remains under pressure, the Group II loans ratio increased significantly from 5.4% in 2017 to 10.2% in 1Q18 (or from 2.4% to 7.1%, excluding the $1.7bn Otas exposure). While we are not surprised that the Group II loans are rising following the headlines concerning Yildiz and Dogus Holding (AKBNK has confirmed that its loan to Yildiz is included in the Group II loans category), the deterioration in this ratio is startling. AKBNK, as a significant lender to large corporates, is likely to be affected if more large businesses attempt to restructure their loans. We expect to see this trend appearing in GARAN and ISCTR’s numbers too, as they are also major lenders to the Turkish large corporate sector. Turning to liquidity and capitalisation, the loans/deposits ratio was maintained at a strong level of 104% (sector average: 120%), while the bank unsurprisingly showed more stretched liquidity metrics in TRY than in FX, which is a feature common to the sector. Not only have TRY deposits been declining as depositors switch to USD, but the demand for TRY loans has increased as a result of the CGF. In Akbank’s case, the loans/deposits ratio in TRY was 144% (up from 133% a year ago and from 140% in Q4), while in FX it is 73% (down from 78% in 1Q17). TRY deposits were flat QoQ, while FX deposits rose 3% in USD terms, showing that Turkish depositors have still not regained confidence in their currency. Meanwhile, the Tier 1 ratio rose 20bp YoY to 13.6%, one of the strongest numbers in the sector, although this was 60bp weaker QoQ. The annual comparison was boosted by the fact that CGF loans attract a 0% risk weighting, while current lending has reverted to the usual rules. Weaker TRY and dividend payments also played a part. Total CAR stood at a healthy 15.6%. We expect the bank to expand its capital base in the coming quarters now that dividend payments are out of the way. Organic capital generation is in the region of 60bp per quarter. As for the loan book, we find it interesting to look at the main growth areas, which helps us to identify the segments in which the bank sees the greatest opportunities. Akbank’s lending numbers show a clear preference for riskier, more profitable lending (smaller businesses over large corporates, GPLs over mortgages), though that could also reflect the slowdown in the housing market and demand for credit from the large firms. We use QoQ numbers to avoid the CGF distortion visible in YoY figures. The headline 5% QoQ overall growth of the book to TRY 223bn masks the divergence between loan classes. While TRY denominated loans grew by 3%, their FX counterparts rose just 2% in USD terms due to lack of demand. Within the TRY book, Business Banking loans increased 4% (Corporate +2%, Commercial +5%, Other Business +6%), while Retail loans rose by just 1% (Consumer +2%, boosted by 6% growth in the unsecured lending book, offset by Mortgages -3% and Credit Cards -2%). By contrast, within the FX bucket, Corporate loan growth of 1% was augmented by a 5% increase in Commercial loans. Business loans accounted for 79% of AKBNK’s total loan book; little changed YoY. We note that Akbank’s assets and liabilities remain reasonably well matched by currency, although the lack of TRY funding remains a concern. On the asset side, FX securities comprised 53% of the total, while FX loans accounted for 39% of total loans. Meanwhile, FX deposits made up 56% of total deposits, up from the recent low of 47% at end-3Q16, as re-dollarisation continued. For 2018, Akbank is assuming GDP growth of around 4.5% and CPI inflation of about 9.0%. Loans and deposits should both grow at 13-15% (1Q18 annualised result: +19%, matching deposit growth), one percentage point faster than the sector. The bank expects NIM to fall back slightly to 3.5%, the loans/deposits ratio to remain anchored below 105% and NPLs to be stable at 2.1%. If this guidance pans out, it will mark a year of relative stability following the turbulence the sector has experienced since 2016.